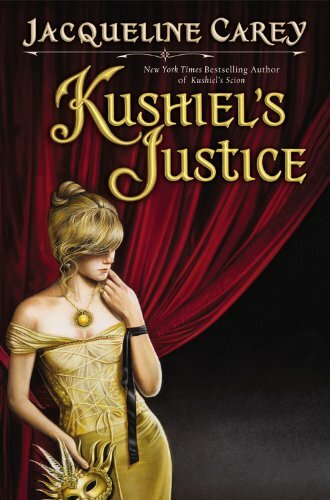 I am once again behind on my reviews, so I’ll be reviewing the second Kushiel’s Legacy trilogy (Kushiel’s Scion, Kushiel’s Justice, and Kushiel’s Mercy) in this post. WARNING: Contains spoilers for the first (Phèdre) trilogy – Kushiel’s Dart, Kushiel’s Chosen, and Kushiel’s Avatar. Our protagonist is now Imriel de la Courcel, the son of the infamous Melisande Shahrizai, Terre D’Ange’s greatest traitor, and the foster son of our beloved Phèdre and Joscelin. The story begins with a fourteen year old Imriel, who is being raised by Phèdre and Joscelin, much to Queen Ysandre’s chagrin. I’m a sucker for good coming of age stories, and this is definitely one of them. Imriel is a complex and sympathetic character, and his character arc is thoroughly satisfying. He starts out as a confused young man, unsure of how to deal with his parentage and the mistrust that that generates, despairing of ever living up to his foster parents – heroes of the realm, sickened by his desires (being Kushiel’s scion and having lived through the zenana of Darsanga do not mix well.) He finds friendship and attraction, maybe even love, and escapes Terre D’Ange, before realising that he can’t run away from who he is. And of course, he ends up saving a few people along the way. As with all of Carey’s stories, the plot just flows and is beautifully written. It’s fascinating to see Phèdre viewed through third party eyes, as well as others, like Nicola L’Envers y Aragon and Queen Ysandre, who Imriel does not like, and the Shahrizais, who Phèdre has always mistrusted (but Imriel gets along with.) Phèdre and Joscelin make great parents, and it’s a joy to see them in this role. I also enjoyed the quintessential coming-of-age experience – university. Traveling to yet another part of Carey’s Earth was terrific – especially a city as iconic as Rome. Imriel’s relationships, both friendships and romances were also very believable. And of course, there’s the Unseen Guild, which I couldn’t wait to learn more about. The climax in Lucca – both the problem and the resolution were not what I expected, although they were foreshadowed heavily. Carey seems to be using more and more magic as the series progresses, but that’s not a bad thing. Overall – great characters, great world, great writing, great story. The end is especially touching. After the events of Kushiel’s Scion, Imriel nó Montrève de la Courcel has realised that he must accept who he is and his position in life. In light of this, he agrees to Ysandre and Drustan’s proposal that he wed Dorelei, an Alban princess, so that his children can inherit the Alban throne and Terre D’Ange’s ties with Alba are solidified. However, he doesn’t account for his crush on Sidonie – his cousin and heir to the throne of Terre D’Ange – developing into a torrid (mutual) love which must be kept secret. 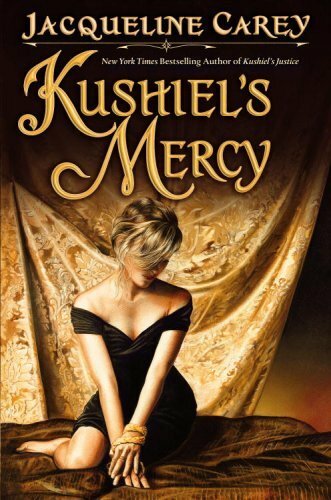 This book is a further coming of age for Imriel – he’s accepted his parentage and his personal desires, but he does not yet understand what it means to be D’Angeline, especially of Elua and Kushiel’s lines. He weds Dorelei in the name of duty, but this violates Elua’s one precept, “Love as thou wilt“. Alba’s great magicians, the Maghuin Dhonn (people of the brown bear), oppose Imriel and Dorelei’s union, and bind him magically with his desire for Sidonie. Things go downhill from there. In the end, at great personal cost, Imriel learns that he should not defy the will of the gods (especially when it is also his own will) for the sake of duty, and also truly accepts Kushiel’s gift of merciful justice. This book is tremendously sad, but a good read – Carey is truly a skilled writer. 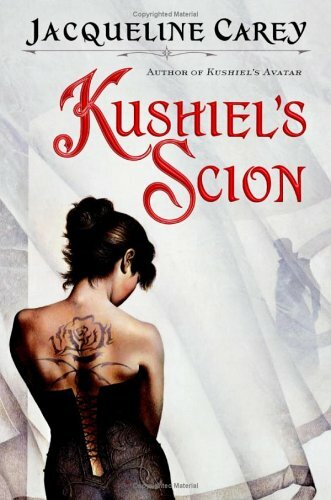 All my compliments for Kushiel’s Scion apply here as well. Imriel has survived the events of Kushiel’s Justice and is finally fully at peace with himself. His relationship with Sidonie has been publicly revealed, and Queen Ysandre is beside herself with anger. She cannot openly forbid their love – that would be against Elua’s precept, but she has threatened to disinherit Sidonie if she marries Imriel – unless he can track down Melisande Shahrizai and bring her to Terre D’Ange to be executed. Imriel has no great love for his mother, but he doesn’t really want to see her executed. However, he loves Sidonie, so he resolves to fulfill Ysandre’s condition anyway. Before he can begin, however, Terre D’Ange faces a greater threat – one which could drive it to destruction. This is probably my least favourite of the Imriel books (it’s still very very good) – I would’ve loved the straight up story of Imriel having to find his mother. I loved that portion of the story – Melisande meeting Imriel, and her redemption, and the full circle that the characters came to. However, a large portion of the book is dedicated to magic, memory loss and effects of arcane arts, which wasn’t nearly as interesting. The thing about Carey’s magic is that it doesn’t have any rules – magic can do anything, and there’s no described system. It can be a deus ex machina or a huge obstacle.I think her strongest writing is to do with characters and their motivations and their actions – that seems to follow a logical pattern, at least. The magic does afford Imriel the chance to save Terre D’Ange and be reckoned a hero, though – the populace finally loves him. It was heartbreaking to see Phèdre and Joscelin be deluded by magic – that’s just not done. However, deluded-Imriel and deluded-Sidonie falling in love again made for a more compelling romance than their actual romance. A fairly good end to the trilogy. This entry was posted in Books, Reviews and tagged book 1, book 2, book 3, book 4, book 5, book 6, fantasy, fiction, series by Kriti Godey. Bookmark the permalink.